In nearly every application you can install and use plugins (Firefox, Outlook, IE...). With .NET 4.0 you get a new feature to create extensible applications called "Managed Extensibility Framework" in short "MEF". You can today play with a preview of this upcoming framework. Microsoft itself will use it in Visual Studio 2010 (take a look at the PDC Keynote from Scott Guthrie). A very nice demo of MEF was in the PDC session of Scott Hanselman and his "BabySmash". But there are a lot of other great MEF PDC Sessions. The "System.AddIn" Namespace was introduced in .NET 3.5, but it was very hard to create addins. But MEF and System.AddIn should play well together. What´s needed to play with MEF? Everything you needed to start you can download at the Codeplex Site. Just download the newest release and copy the 2 DLLs in your project directory (Disclaimer- it´s still in development, everything might be changed until the release). 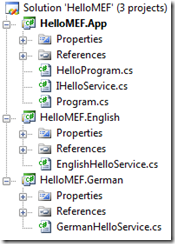 Important for MEF is the "Export" attribut from the "System.ComponentModel.Composite" (MEF) Namespace. Export means: This is a "IHelloService" plugin. Both projects need only the reference to the HelloMEF.App because of the IHelloService interface. The HelloMEF.App doesn´t know anything about these projects! 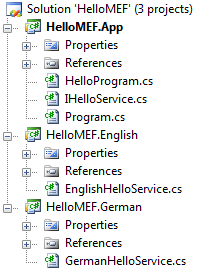 Inside the "HelloProgram" class is a "IHelloServices" list, which is decorated with the "Import" attribute from the MEF namespace. Import means: I took everything of type IHelloService. 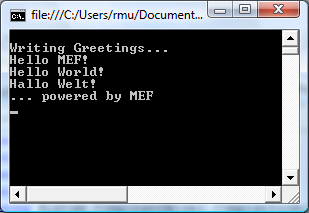 The "WriteHelloGreeting" just iterate over the services list and write the message to the console. Through the container we tell MEF that here is a plugin interface (the list with the import attribute) and start the "compose" process. The plugins could be placed inside the assembly. MEF find these plugins through this catalog: "AttributeAssemblyPartCatalog"